28-06-2018 - Public hearing on "VAT Fraud"
On 28 June 2018, from 11.00 to 13.00, the TAX3 Special Committee will hold a hearing on VAT Fraud. Member States in the European Union are yearly losing around 150 billions of euros in value-added tax (VAT) revenues because of fraud, mainly cross-border fraud, and inadequate tax collection systems. One can wonder why a solution to tackle VAT fraud could not be found while the problem is known since the introduction of the EU VAT transitional system in the nineties. The current review of the EU VAT framework aims at creating a more simple and transparent system that prevents and fights cross-border VAT fraud. Yet, the question is: end of the VAT transitional regime, end of the VAT (carousel) fraud? 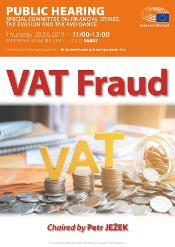 Invited experts will enlighten the TAX3 Committee on ways to reduce VAT fraud. Member States' cooperation in the fight against fraud, notably via Eurofisc, will be addressed as well as how innovation can help reducing VAT fraud or be used for fraud purposes (notably with the use so-called zappers).